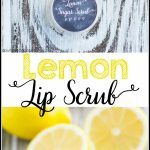 Exfoliate and moisturize dry lips with this refreshing lemon lip scrub. In a small bowl combine jojoba oil, honey, and a few drops of lemon essential oil. Stir in sugar; mix until fully combined with honey. Apply to lips and gently rub to exfoliate. Leave on lips for a minute or two to help the jojoba oil moisturize. Use a wet washcloth to remove scrub.